Comments: On 20th April 1983 Marvel UK began publication of The Mighty Thor, a new weekly title which, as the name suggests, reprinted Marvel US' Thor title. 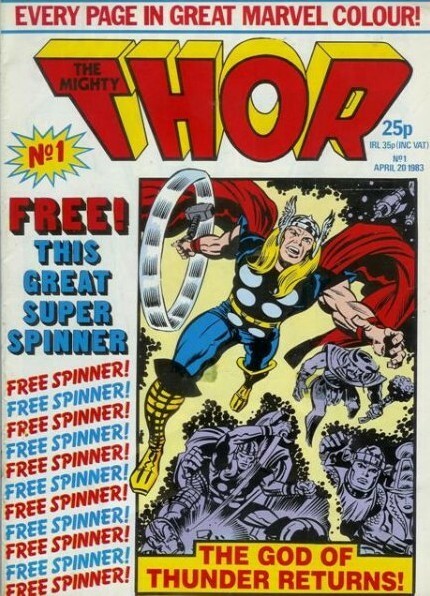 As was commonplace for British comics at the time, the first few issues included free gifts to encourage readers to try out the new series; in The Mighty Thor #1 this was a "space spinner" (four-pronged throwing toy) and in The Mighty Thor #2 a sticker of Thor. With the 20th issue the title became Thor and the X-Men, as The Mighty Thor absorbed failing sister title The Original X-Men. With sales dropping, 11th January 1984's #39 was the last for Thor and the X-Men. A week later it was absorbed into Spider-Man and his Amazing Friends #567, Marvel UK's frequently renamed longest-running title.